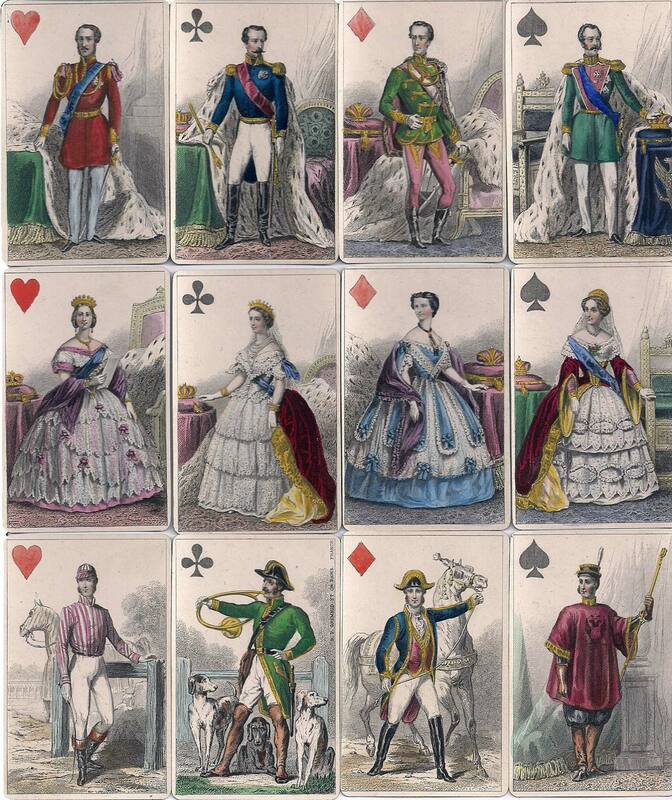 Cartes Imperiales et Royales were first published by B. P. Grimaud & Cie with full-length court figures representing imperial rulers and consorts from Austria, England, France & Russia an the mid-19th century. The four kings are the Prince Consort of England, the Emperor Napoleon III, the Emperor of Austria and the Tsar of Russia. The queens are Queen Victoria, the Empress Eugenie, the Empress of Austria and the Tsarina. The knaves are a jockey, a royal huntsman, an imperial groom and a royal serf. The four aces carry the arms of England, the imperial arms of France and the arms of Austria and Russia. A shield of pretence at the centre of each armorial bearing carries the suit symbol (click to zoom). Above: ‘Cartes Imperiales et Royales’ first published by B. P. Grimaud & Cie, 70 Rue de Bondy, Paris, representing imperial rulers and consorts from Austria, England, France & Russia, mid-19th century. Hand coloured etchings. Lettering on the knave of clubs reads "B.P. Grimaud et Cie. Paris France", and on the ace of clubs is "Imp. F. Chardon ainè r. Hautefeuille, 30, Paris". The backs are coloured blue. Images of a later edition with rounded corners, c.1890, courtesy Rod Starling.